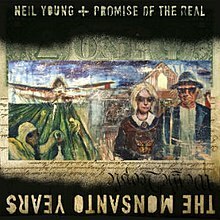 The Monsanto Years is a studio album by Canadian singer-songwriter Neil Young and American rock group Promise of the Real, released on June 29, 2015 on Reprise Records. A concept album criticizing the agribusiness Monsanto, it is Young's thirty-fifth studio album and the third by Promise of the Real. The group is fronted by Willie Nelson's son Lukas, and the album also features Lukas' brother Micah. The album was produced by both Young and John Hanlon, and is accompanied by a film documenting the recording process. Young had a long-time friendship with Willie Nelson and his sons, Lukas and Micah and jammed with Lukas' bandmates in Lukas Nelson & Promise of the Real after 2014's Farm Aid. Recording for this album began the following January. Young announced that he was recording an album with the band —including non-member Micah— at a converted movie theater Teatro in Oxnard, California, the site where Willie Nelson's Teatro album was recorded. Young sent a CD to his collaborators with demos to allow them to learn some of the new songs before arriving to perform together on the new compositions. The recording was filmed by Don Hannah alongside live rehearsals in April 2015 for a film also entitled The Monsanto Years. Young debuted a music video for "Wolf Moon" on June 10, 2015. In a highly positive review, The Guardian's Jon Dennis gave the album five stars out of five. Praising the contributions of Promise of the Real, Dennis wrote: [The band] sound not unlike Crazy Horse, and supply all the big riffs, crashing major chords and harmonies that have characterised Young’s best records for five decades." Zach Schonfeld of The A.V. Club gave the album a "C" rating, opining that the concept of the album and its execution were "underproduced, underwritten, and not likely to take up more than a few months (if not weeks or days) of Young's promotional energies before he moves to the next thing" but with some highlights among the harder rock songs. Thomas Erlewine of Allmusic.com gave the album 3,5 stars out of 5 claiming that: "Young uses his sturdy footing to lash out at what he perceives as destructive forces -- to our dinner tables and social fabric -- and if the individual message may wind up fading like yesterday's newspapers, the music will keep The Monsanto Years burning bright". Billboard solicited the opinions of corporations criticized on the album, including Monsanto, whose representative said: "Many of us at Monsanto have been and are fans of Neil Young. Unfortunately, for some of us, his current album may fail to reflect our strong beliefs in what we do every day to help make agriculture more sustainable. We recognize there is a lot of misinformation about who we are and what we do—and unfortunately several of those myths seem to be captured in these lyrics." Notably all the corporations mentioned in album lyrics except for Chevron provided their responses for the request to comment on the album songs. Reacting to the "Big Box" track Walmart said: "As you might have seen recently, Walmart raised its lowest starting wage to $9 an hour. We’re proud of the opportunity we provide people to build a career and have a chance at a better life." while Starbucks commented on the "A Rock Star Bucks a Coffee Shop" track: "Starbucks has not taken a position on the issue of GMO [genetically modified organism] labeling. As a company with stores and a product presence in every state, we prefer a national solution." An Associated Press review of the album argued that Young's criticisms of corporate greed descend into preachiness, saying Young's anger is "so real that it could be tasted, but there is something discomfiting about Young positioning himself as an all-knowing seer, putting people down for wanting simpler, cheerier songs." The album debuted at No. 21 on the Billboard 200 albums chart on its first week of release, selling around 98,000 copies in the United States in its first week. It also debuted at No. 4 on Billboard's Rock Albums chart. and No. 2 on the Folk Albums chart. As of June 2016, the album has sold 300,000 copies in the US. ^ a b "The Monsanto Years - Neil Young,Lukas Nelson & Promise of the Real | Songs, Reviews, Credits | AllMusic". AllMusic. Retrieved December 9, 2016. ^ a b c d Greene, Andy (May 1, 2015). "Behind the Scenes of Neil Young's New Protest Album The Monsanto Years". Rolling Stone. ^ Greene, Andy (January 8, 2015). "Neil Young Recording New Album With Willie Nelson's Sons". Rolling Stone. ^ Levine, Nick (June 10, 2015). "Neil Young Debuts New Song and Video 'Wolf Moon' – Watch". NME. IPC Media – Inspire (Time Inc.). ^ "Reviews for The Monsanto Years by Neil Young". Metacritic. Retrieved July 19, 2015. ^ a b Schonfeld, Zach (June 16, 2015). "Neil Young Rants About Agriculture on The Monsanto Years". The A.V. Club. ^ a b Jon Dennis. "Neil Young + Promise of the Real: The Monsanto Years review – on angry, brilliant form | Music". The Guardian. Retrieved July 19, 2015. ^ Dolan, Jon (June 16, 2015). "Neil Young and Promise of the Real The Monsanto Years Album Review". Rolling Stone. Retrieved July 19, 2015. ^ "Neil Young takes no prisoners on new album The Monsanto Years". Stuff.co.nz. Retrieved July 19, 2015. ^ Gensler, Andy (June 16, 2015). "Neil Young's Corporate Targets Respond to Him Calling Them Out on New Album". Billboard. Prometheus Global Media. ^ "Neil Young's Corporate Targets Respond to Him Calling Them Out on New Album". Billboard. Retrieved December 9, 2016. ^ "Billboard 200". Billboard. July 18, 2015. ^ "Rock Albums". Billboard. July 18, 2015. ^ "Folk Albums". Billboard. July 18, 2015. ^ "ARIA Australian Top 50 Albums Chart". Australian Recording Industry Association. July 13, 2015. Retrieved July 11, 2015. ^ "Ultratop.be – Neil Young + Promise of the Real – The Monsanto Years" (in Dutch). Hung Medien. Retrieved February 4, 2017. ^ "Ultratop.be – Neil Young + Promise of the Real – The Monsanto Years" (in French). Hung Medien. Retrieved February 4, 2017. ^ "Dutchcharts.nl – Neil Young + Promise of the Real – The Monsanto Years" (in Dutch). Hung Medien. Retrieved February 4, 2017. ^ "Neil Young + Promise of the Real: The Monsanto Years" (in Finnish). Musiikkituottajat – IFPI Finland. Retrieved February 4, 2017. ^ "Longplay-Chartverfolgung at Musicline" (in German). Musicline.de. Phononet GmbH. Retrieved February 4, 2017. ^ "Greekcharts.com – Neil Young + Promise of the Real – The Monsanto Years". Hung Medien. Retrieved Week 44, 2015. ^ "Top 40 album DVD és válogatáslemez-lista – 2015. 27. hét" (in Hungarian). MAHASZ. Retrieved July 10, 2015. ^ "Italiancharts.com – Neil Young + Promise of the Real – The Monsanto Years". Hung Medien. Retrieved February 4, 2017. ^ "Swedishcharts.com – Neil Young + Promise of the Real – The Monsanto Years". Hung Medien. Retrieved February 4, 2017. ^ 9, 2015/7502/ "Official Albums Chart Top 100". Official Charts Company. Retrieved July 6, 2015. ^ "Neil Young Chart History (Billboard 200)". Billboard. ^ "Neil Young Chart History (Top Americana/Folk Albums)". Billboard. ^ "Neil Young Chart History (Top Rock Albums)". Billboard. ^ "Neil Young Chart History (Top Tastemaker Albums)". Billboard. This page was last edited on 13 March 2019, at 00:06 (UTC).